Trilateral Agreement of Cooperation and exchange of good regulatory practices was signed at an official meeting in Athens by the presidents of the energy regulators of Bulgaria, Greece and Romania – assoc. prof. Ivan Ivanov (EWRC), Dr. Nikolaos Boulaxis (RAE) and Mr. Nikulae Havrilet (ANRE). EWRC member Alexander Yordanov participated in the meeting too. The Agreement of Cooperation establishes a collaboration framework between the three regulators in order to enhance the quality of regulatory processes and to harmonize the regulatory practices in the context of implementing European Energy Union goals, outlined in the Third energy package. The cooperation plan envisages periodic working meetings of the three regulators on issues of mutual interest, exchange of information, papers and useful regulatory practices. Some initiatives for development of the regulators’ expert staff were planned as well. At the conversations led, the three national regulatory authorities’ chairs shared the opinion that the Agreement contributes to the cooperation development for the benefit of all parties involved. Issues related to the regulatory practices of the participating countries have been discussed, as well as the organization of the administration activities and possibilities to collaborate in establishing common initiatives on priorities of regional matter. EWRC Chairman presented information on measures undertook by the Bulgarian regulator for the harmonization of the national regulatory framework with the directives and regulations of the Third energy package. EWRC had adopted Market Rules, Rules for access to the gas transmission networks and balancing, for interoperability, data exchange and etc. The Regional Booking Platform had been implemented to be used by Bulgartransgaz EAD in entry-exit points with neighbouring EU MS operators to conduct tenders for the allocation of daily, monthly, quarterly and annual capacity. In a bilateral meeting between the delegations of EWRC and RAE the possibilities to accelerate the construction processes of the Komotini-Stara Zagora interconnection have been discussed. Assoc. 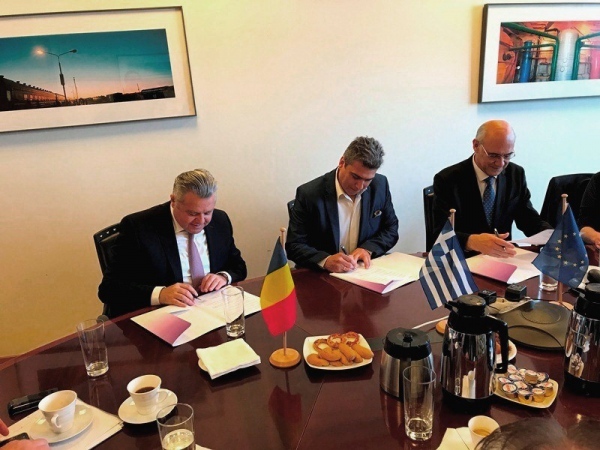 prof. Ivan Ivanov praised highly the endeavours of the Greek regulator and all stakeholders engaged in the final Interconnection Agreement of the gas transmission systems of Bulgaria and Greece. Within the visit in Athens, assoc. prof. Ivan Ivanov and Mr. Alexander Yordanov had a working meeting with ANRE too in order to discuss the changes in the national regulations related to power and gas market developments. © 2017 Energy and water regulatory commission. All right reserved.